Project Overview: This Watch List item refers to a proposal, approved by the City Council in 2012, to convert the Tennis Club in Newport Center (abutting the eastern end of the Newport Beach Country Club golf course, and not to be confused with the similarly-named Tennis Club in Eastbluff) into a tennis resort, with homes, rental bungalows and an event center. 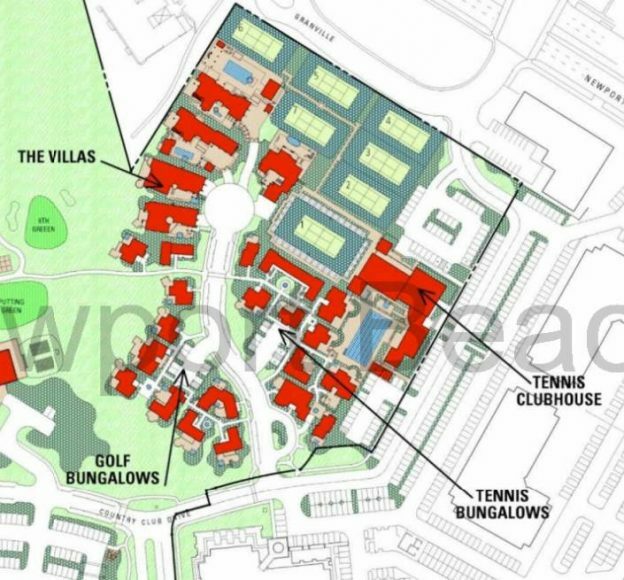 The existing 24 tennis courts would be reduced to 7, but the 3,725 square foot clubhouse expanded, plus 5 homes and 27 hotel room like bungalows would be added, In all, the non-residential development would expand to 38,000 sf, adding 34,275 sf of development that is not in the General Plan and was never approved by voters. Why We’re Watching: The property owner’s wish to “upgrade” the entire Newport Beach Country Club site, including building a new stadium tennis resort, was long known to the City. And the original proposal seems to have been designed to fit within the General Plan development limits approved by voters in 2006. The golf clubhouse would be rebuilt at its existing size, the 5 dwelling units would come from a floating pool of 450 units in Newport Center approved in 2006, and the 27 rental bungalows would be transferred from unbuilt hotel room entitlements approved elsewhere in Newport Center, adding no net development that had not previously been approved, and hence not needing a Greenlight vote and, arguably, not even a General Plan amendment. The proposal hit two snags. First, a competing proposal by the golf course lessee emerged, requesting a massive expansion of the golf clubhouse (which would require a General Plan amendment). And second, the corporate owner of the nearby Marriott Hotel objected to the transfer of unused hotel room allocations from elsewhere in Newport Center (most of which had been, perhaps improperly, converted to office entitlements for the benefit of The Irvine Company). To “solve” the latter problem, and despite City staff’s objections, the Planning Commission recommended, and the City Council accepted, the idea of creating entitlements for the 27 rental bungalows by “converting” the entitlement for 17 existing tennis courts being removed in the plan, finding that “consistent” with the General Plan (with no need, according to the Planning Commission) to formally amend it. The problem is that the combination of the square footage created by the General Plan amendment for the enlarged golf clubhouse combined with the new hotel room square footage (created by “conversion” rather than transfer of previous approvals) adds non-voter-approved development to Newport Center far in excess of the 10 year limit allowed by Greenlight (City Charter Section 423) — not even counting other development added to Newport Center in the last 10 years, including the Central Library expansion and the 100,000 sf. new City Hall. Although approved in 2012, the Tennis Club project now needs a Coastal Development Permit to proceed to construction. Whoever is responsible for the earlier mix up, SPON strongly objects to allowing construction that exceeds the amounts allowed in the currently published General Plan by an amount that, if acknowledged as an amendment to that Plan, would have triggered the need for a Greenlight vote. No upcoming events currently scheduled. November 20, 2018: The City held a special Zoning Administrator hearing at which the Administrator approved a Coastal Development Permit for the construction and for a Tentative Parcel Map for the consolidation of 11 parcels and a Vesting Tentative Tract Map. June 28, 2018: A tentative agenda published by the Community Development Department indicated the Coastal Development Permit application could be considered by the Zoning Administrator as early as the June 28, 2018, meeting. May 1, 2017: City receives planning application PA2017-091 for a new Coastal Development Permit to replace the expired one allowing construction of the Golf Realty proposal for the Tennis Club resort. April 27, 2017: As Item 4 on his agenda, the City’s Zoning Administrator reviewed the Development Agreement for the Tennis Club renovation, DA2008-001. As the staff report indicates, the Coastal Development Permit for the Tennis Club, previously approved by the Coastal Commission, had been allowed to expire, and a new one would be needed before any construction could take place. April 10, 2013: As Item W18b, the California Coastal Commission approves a Coastal Development Permit for the Golf Realty Tennis Club proposal. The approval does not mention or appear to include the Development Agreement, despite the Gov. Code Sec. 65869 requirement for CCC approval of agreements made in jurisdictions not having a fully certified Local Coastal Program. December 12, 2012: As Item W11a (postponed from Item W7b on September 12, 2012, and Item Th20c on October 11, 2012), the California Coastal Commission approves a Coastal Development Permit for a new 69,088 sq. ft. golf facility (this did not include consideration of the Tennis Club proposal). March 13, 2012: As Item 14 on their agenda, after considerable discussion, the Council adopts some resolutions and re-introduces various ordinances related to the Golf Realty application. Mayor Nancy Gardner was the sole “no” vote. February 28, 2012: Council continues second readings of Golf Realty matters to March 13 (see Item 8). February 14, 2012: Council completes second reading of ordinance approving IBC Development Agreement and amendments to the Planned Community text increasing the size of the golf clubhouse from 35,000 to 56,000 square feet, but continues Golf Realty second readings to February 28 (see agenda Item 5 and Item 6). Mayor Nancy Gardner voted “no” on the IBC approvals. January 24, 2012: City Council conditionally accepts Planning Commission recommendation from November 17, 2011, adopting Resolution No. 2012-10 approving a conversion of 17 tennis courts to 27 hotel rooms. The earlier staff memo to the Planning Commission explaining this would require a General Plan amendment was include as Attachment CC15 to the Item 14 staff report. Resolution No. 2012-10 is said to include approval of a Vesting Tentative Map, but the rights it might convey are unknown since the map is is not attached to the resolution and the page where the map was supposed to appear in the Clerk’s archive of Item 14 seems to be blank, as well. November 17, 2011: Planning Commission recommends Council approve IBC plan for golf clubhouse and Golf Realty plan for Tennis Club (see agenda Item 2 and Item 3). A major point of contention, and major reason for selecting the club’s proposal for the new Golf Clubhouse over the O Hill plan (see Planning Commission action report submitted to the City Council as Item 14 on November 22, 2011) was the retention of the frontage road to the Armstrong Nursery along Pacific Coast Highway. Months after the club’s plan was approved by the Council (and by the Coastal Commission), the frontage road was quietly deleted by a “staff approval” (see April 25, 2014). Regarding the Golf Realty proposal, City staff argued (see page 3 of the Item 2 staff report and Attachment PC4) that conversion of voter-approved tennis courts to hotel rooms required a General Plan amendment. The Planning Commission rejected staff’s analysis and recommended the conversion as a creative workaround to the applicant’s inability to move voter-approved hotel room allocations from elsewhere in Newport Center. October 20, 2011: Planning Commission continues to hear the competing plans, again as Item 2 and Item 3. August 4, 2011: As Item 2 and Item 3, Planning Commission hears Golf Realty plan for Tennis Club renovation and competing plan from International Bay Clubs for golf clubhouse rebuild. August 11, 2009: City Council, as Item 27 on agenda, adopts Resolution No. 2009-60 rescinding Resolution 2009-2 (which had initiated a General Plan amendment for the proposed tennis and golf club expansions), saying the competing applicants would need to make separate requests to initiate General Plan amendments. January 27, 2009: City Council, as Item 6 on agenda, adopts Resolution No. 2009-2 initiating a General Plan amendment for the proposed tennis and golf club expansions. July 28, 2008: City receives planning application PA2008-152 from golf course lessee, International Bay Clubs (the operator of the Balboa Bay Club), for General Plan amendment to allow larger clubhouse. March 13, 2007: The Daily Pilot reports City staff told Mr. O Hill he will need an additional General Plan Amendment to add the MU-H3 hotel rooms to his Tennis Club site. November 7, 2006: By approving Measure V (Resolution No. 2006-77), Newport Beach voters give the “Greenlight” to new General Plan development limits (see Resolution No. 2006-103). The Tennis Club portion of the Country Club property is given a land use designation (MU-H3/PR) making it eligible for a portion of a floating allocation, made to similarly designated portions of Newport Center, of 450 new residential units and 65 hotel rooms. June 20, 2005: City receives planning application PA2005-140 for renovation of Newport Beach Country Club, including construction of a new tennis club resort and a rebuild of the golf clubhouse. November 1992: The Irvine Company sells 132 acre golf and tennis club properties to investors headed by Robert O Hill, retaining long-term lease for golf portion to International Bay Clubs (owner/operator of the Balboa Bay Club). This entry was posted in Watch List and tagged Greenlight, Newport Beach Country Club, Tennis Club in Newport Center on July 2, 2017 by Jim Mosher.